BE A PART OF OUR 36TH SEASON! 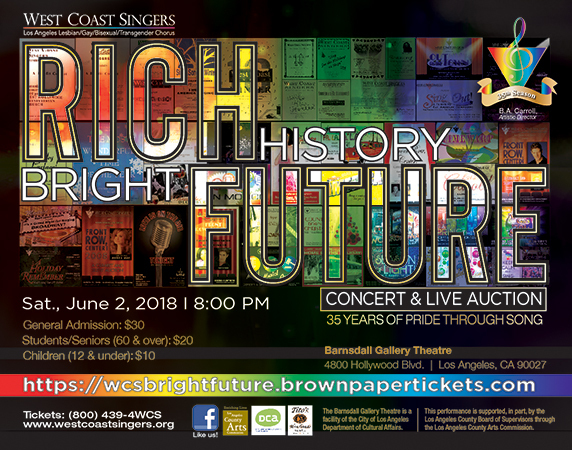 SATURDAY, JUNE 1 AT 8:00 PM ENJOY OUR LIVE AUCTION, FUN RAFFLE, SMALL BITES, TITO'S HANDMADE VODKA COCKTAILS AND, OF COURSE, THE CONCERT! Join us and be a part of our 36th year! Spring Auditions are now open for all voice parts! Interested singers should have some choral experience, be able to maintain/match pitch, willing to attend and work in weekly rehearsals, able to practice on your own when needed (downloadable rehearsal CDs are available), and be open to having a fun time. Are you an alum? Come back and be a part of our exciting 36th year! Auditions will be held on Monday, January 14, 2019, from 7:00 to 9:30 PM at the Angelus Plaza Senior Activity Center in downtown Los Angeles. We can make special arrangements if that night does not work with your schedule–just ask. 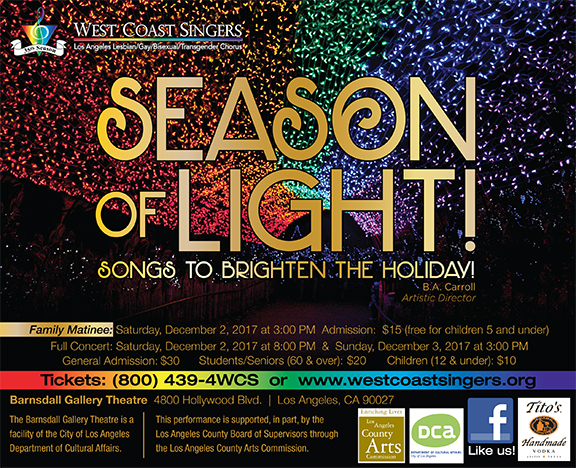 For more information and to set up an audition, email auditions@westcoastsingers.org or call/text (818) 404-5740. You can also download an application by clicking Audition Application. 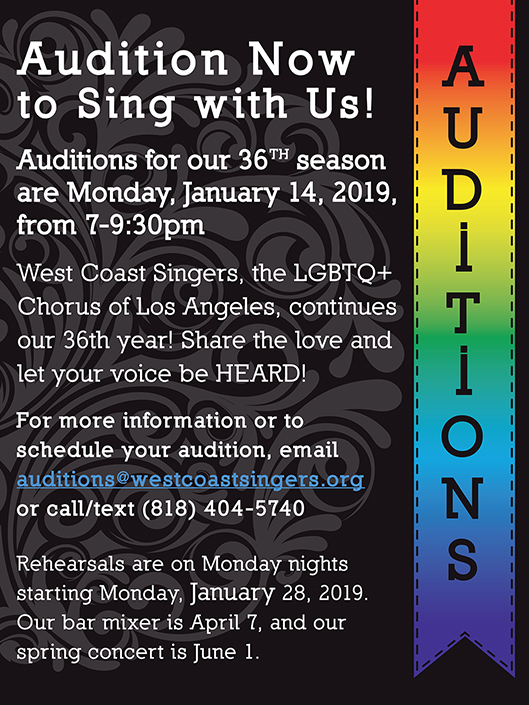 We rehearse on Monday nights and start our Spring season on Monday, January 28, 2019! Our bar mixer event is April 7 followed by our exciting Spring concert on June 1. Enjoy our raffle, small bites, Tito's Handmade Vodka cocktails, and, of course, the concert. Getting in the mood and filled with the holiday spirit has never been easier than attending our annual holiday concert. 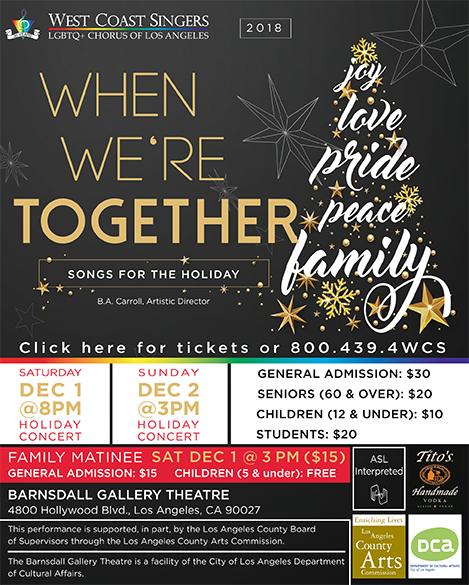 This year’s concert is focused on what brings us together in the season: joy, peace, family, pride, and love, blended with some holiday favorites. And of course, no holiday concert would be the same without our annual Handel’s Messiah Hallelujah Chorus sing-a-long! Our holiday concert comes just in time for you to kick off the holiday season! Like many past years, our concert will enable an audience member (one per concert) a chance to win $300 in our fun and easy Heads ‘n’ Tails Raffle! Join us for a 40th Celebration! 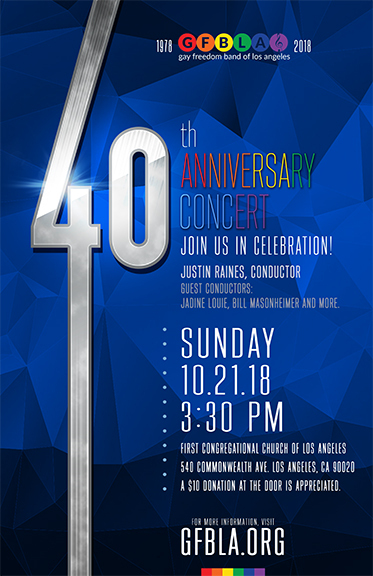 We had a great time join in with the the Gay Freedom Band of Los Angeles’ 40th Anniversary Concert Sunday, October 21st! We were excited to add our voices and perform Eric Whitacre’s beautiful composition, ‘Sleep.’ If you are not familiar with the piece it is wonderful, and the director of the Gay Freedom Band, Justin Raines, was great and dedicated the performance to all the members of the band who have passed on. We were very happy to be invited and included. West Coast Singers has a special connection with the GFBLA as we actually stemmed from the band 35 years ago on October 31, 1983. A handful of members that had been singing with the Freedom Band officially broke off to start the chorus. 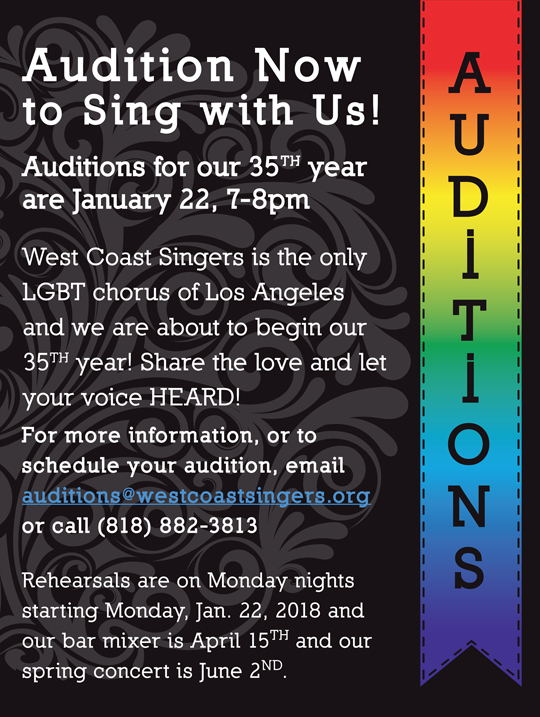 Now West Coast Singers is the third oldest lesbian, gay, bisexual, and transgender, mixed-voice chorus in the nation. It is hard nowadays to understand, but in the early 1980s it was a difficult time to be gay, let alone out and gay. The original intent was to provide a safe place for lesbian and gay people to come together and sing. 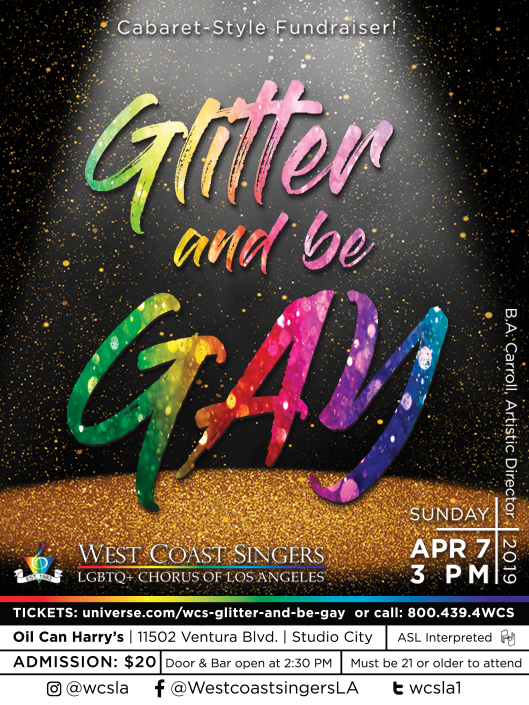 The gay mens chorus (GMCLA) had been around for almost five years but there were no mixed choruses and truthfully, there were not many things that gays and lesbians did together back then, so the West Coast Singers were founded. We enjoyed singing in this beautiful Gothic/Cathedral-style building with amazing traditional acoustics. Join us and be a part of our 35th year! West Coast Singers is headed back to the bar for our 3rd annual fundraiser! Dude! 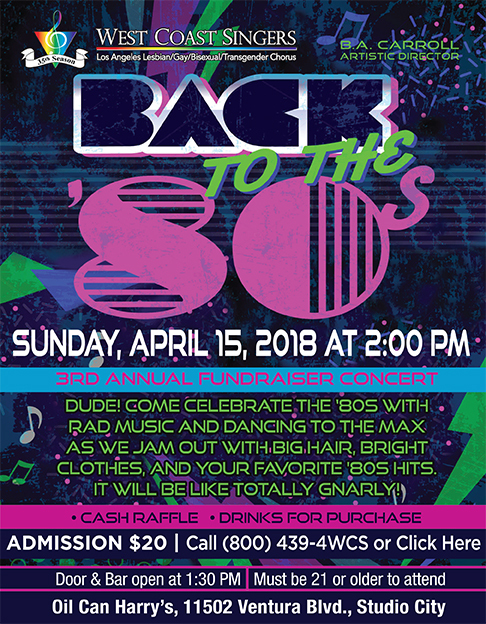 Come celebrate the ’80s with rad music and dancing to the max as we jam out with big hair, bright clothes, and your favorite ’80s hits. It will be like totally gnarly! Live Performance by WCS, small groups and solo acts to round out the show. Drinks for Purchase • Raffle (where you could win $300 cash) • Loads of fun! After we are finished singing, stay around and enjoy your time with the choir because Oil Can Harry’s will be open until 5:00 PM! Doors will open at 1:30 PM and the show will begin at 2:00 PM. There will be a full bar available to purchase your favorite ’80s cocktails and since it is a bar, all attendees must be 21+ to attend. Many thanks to Oil Can Harry’s for again generously sharing their space with us to hold this concert. 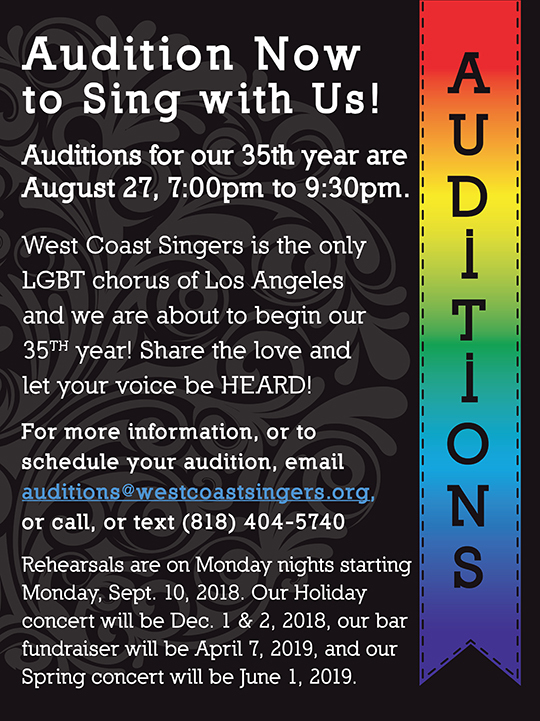 West Coast Singers is the third oldest LGBTQ mixed chorus in the nation. This is part of our 35th season and it will give you a glimpse of what’s in store for our Spring concert on Saturday, June 2. Funds raised from this show will support our scholarships for chorus members, and help send us to the 2020 GALA (Gay and Lesbian Association) Festival of LGBTQ choruses in Minneapolis, MN. Auditions are open for all voice parts however, sopranos and tenors are strongly encouraged to participate. Interested singers should have some choral experience, be able to maintain/match pitch, willing to attend and work in weekly rehearsals, able to practice on your own when needed (rehearsal CDs are available), and be open to having a fun time. Are you an alumni? Come back and be a part of our exciting 35th year! Auditions will be held on Monday, January 22nd, 2018 from 7 PM to 8 PM. We can make special arrangements if that night does not work with your schedule, just ask. We rehearse on Monday nights and start our spring season Monday, January 22, 2018! Our bar mixer is Sunday, April 15th, and our spring concert is Saturday, June 2nd at 8pm. Getting in the mood and filled with the holiday spirit has never been easier than attending our annual holiday concert. This year’s concert is focused on finding the light of the season along with some holiday favorites, a couple traditional songs, our annual Handel’s Messiah Hallelujah Chorus sing-a-long, and, as always, a couple of surprises throughout the night! Our holiday concert, annually the first weekend in December, comes just in time for you to kick off the holiday season! Like many past years, our holiday concert will enable an audience member (one per concert) a chance to win $300 in our fun and easy Heads ‘n’ Tails Raffle!